Today’s workforce has grown accustomed to using personal technologies that make communication easy and simplify their lives. But many enterprise tools haven’t kept pace. Most current project and portfolio management solutions fail to provide simple ways of performing everyday tasks. They don’t facilitate contextual communication that would help to solve problems, and they lack key functionality: the ability to narrow the focus to relevant data, to drill down for additional information and to efficiently forecast financials and model outcomes. 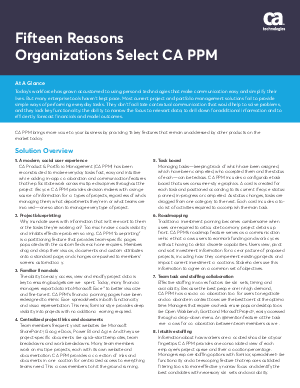 Download this whitepaper now to see how CA PPM brings more value to your business by providing 15 key features that remain unaddressed by other products on the market today.